Nestled amongst the rugged landscape of the Twelve Bens Mountain Range, you’ll ﬁnd our family run business, Cottage Handcrafts. Stockists of over twenty of the finest Irish knitwear companies and small designer craft makers. You will find an extensive selection of knitwear which we have lovingly sourced from all over Ireland. We oﬀer so many styles to keep you warm from the traditional handknit Aran Sweater to contemporary capes, jackets and woollen accessories. 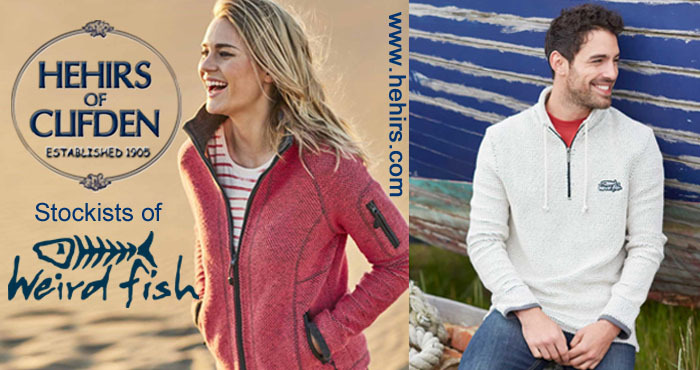 Hehirs is a family run business in the heart of Clifden, Connemara, owned by Michele Hehir & Brian Hehir. 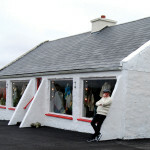 It is an eclectic store, with unique and unusual Ladies & Gents Fashions, Irish Kniitwear, Footwear and Outdoor Clothing. Brands include YaYa, Peruzzi, Darling, Kate & Pippa, Marco Tozzi, Heavenly Feet and many more! 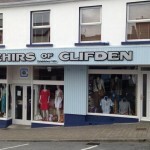 Come and visit our store while you visit Clifden……..You Never Know What You Might Find! 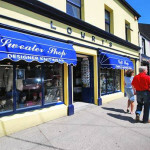 Lowrys Sweater & Gift Shop is a family run store on Market Street in Clifden, Connemara, carrying a large selection of Irish made goods. Lowry’s stocks a large selection of Traditional & Designer Sweaters & regular sweaters at low to mid range prices. Also stockists of rainwear, hats, caps & accessories, rugby & t-shirts along with many other clothing and gift ideas. Ohh! By Gum, chosen as the Irish Times ‘Best Boutique in Ireland’ in 2012. Located in the old Water tower of the Station House Courtyard in Clifden. 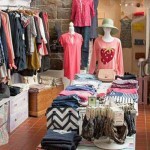 This beautiful boutique offers a wide range of fashion & gifts for women and children. Don’t miss a visit to this wonderful award winning store! Patricia O’ Toole Boutique is the place to go to find something for that special occasion. Patrica’s own brand is a collection of classic wardrobe basics, which are designed to enhance every body type from size 10 and upwards. With built-in contouring shapewear, the collection includes tummy-toning trousers and skirts, shaping tops and slimming dresses. Patrica’s boutique offers pieces of quality, carefully chosen which can be worn season to season. 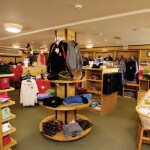 Connemara Golf Links features a wide array of the best equipment and apparel in the industry. Our friendly staff will also help you schedule start times, rent golf carts, trolleys, clubs and register before each round of golf. Our rental clubs are all new 2016 Taylormade M2 clubs. Gift & Green Fee Vouchers are available and make a perfect gift for birthdays, Christmas, or any occasion. Gift vouchers may be purchased on the website or in the shop.